Minnie Deloris Richburg Hillard "Dee"
Celebrating the life of Minnie Deloris Richburg Hillard "Dee"
Obituary for Minnie Deloris Richburg Hillard "Dee"
On Wednesday, September 5, 2018, Minnie Deloris Richburg Hillard, widow of the late Rev. Richard Hillard, heard her master’s call at the NHC Healthcare of Sumter. Born on July 23, 1942, in Summerton, she was a daughter of the late Willie George “Son” & Josie Elizabeth Brailsford Richburg. Service of remembrance shall take place on Monday, September 10, 2018, at 10:00am from the Friendship A.M. E. Church, 6156 Furse Road, Pinewood where the Presiding Elder - Manning District, the Rev. Eddie Gaston, shall preside. The Rev. Albert Thompson, Pastor of the Friendship A.M.E. Church, shall bring words of hope. 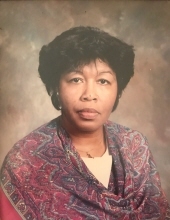 The family is receiving relatives and friends from 12:00pm-8:00pm at the residence of her sister, Margaret Loretta Richburg “Wee Wee”, of 1821 Willie G. Richburg Rd., Summerton. To send flowers or a remembrance gift to the family of Minnie Deloris Richburg Hillard "Dee", please visit our Tribute Store. "Email Address" would like to share the life celebration of Minnie Deloris Richburg Hillard "Dee". Click on the "link" to go to share a favorite memory or leave a condolence message for the family.